Evidentiary professional portable alcohol analyzer for fast and precision testing with the ability to capture results on-site in a "field" environment and GPS system (optional). The Drager Alcotest® 7510 OIML is a compact and robust handheld instrument which, thanks to its special ergonomic design, is suitable for right or left handed users. A non-slip rubber housing offers optimal grip. The device incorporates an innovative transflective, high resolution graphic LCD. The highlighted display provides a full-text view of the message with the ability to select a language and guarantees perfect readability both in bright sunlight and in absolute darkness. In addition, support for information is provided through three color LEDs. The device complies with the maximum in hygiene requirements. The sterile disposable mouthpiece employes a special tab to assure a safe distance between the operators hand and the subject's mouth. For superior hygiene, the Alcotest® 7510 OIML has a special mouthpiece ejection mechanism. The instrument's mouthpiece receiver is iluminated for easy mouthpiece placement even in full darkness. The Alcotest® 7510 OIML represents the first handheld EBT capable of detecting mouth alcohol! This technological advancement is made possible through the employement of a piezo-electric activator as part of this new sampling system. The Alcotest® 7510 OIML offers a GPS module recognizing the exact geographical location where a breath test is performed. Uploading these coordinates to a central computer, the administrator has the ability to establish a map showing the DUI-arrest-density. Furthermore, this technology allows for precise determination of where the test was conducted for possible administrative processing of a specific DUI stop. The Drager Alcotest® 7510 OIML can be used immediately in any environment. The flexible data management, the high memory capacity as well as the option of wireless data transfer to the Drager Mobile Printer or a computer allow for easy adjustment to national and international specifications. Via the ambient pressure sensor, the device automatically compensates for any ambient barometric conditions when performing dry-gas tests. The approved type of measuring instrument Dräger Alcotest® 7510 OIML meets the requirements of DSTU OIML 126:2014 «Evidential gas analyzers of exhaled air (OІML R 126, edition 2012, ІDT)». The Dräger Alcotest® 7510 OIML design allows you to print the measurement results using the Dräger Mobile Printer mobile thermal printer. Overall dimensions not more than 185х90х44 mm (H x W x D) 50/60 x 141 x 31 mm and weight 433g with batteries. Power supply: 4 шт. - 1,5 В alkaline batteries (Mignon, LR6, AA) or 1.2V NiMH rechargeable batteries, or lithium rechargeable battery (option on request). relative error (δ): ± 5% - In the range from 0,8 to 4,0 ‰. relative error (δ): ± 7,5% - In the range from 0,8 to 4,0 ‰. Interfaces and external devices that can be connected: USB / IR interface (communication, service). 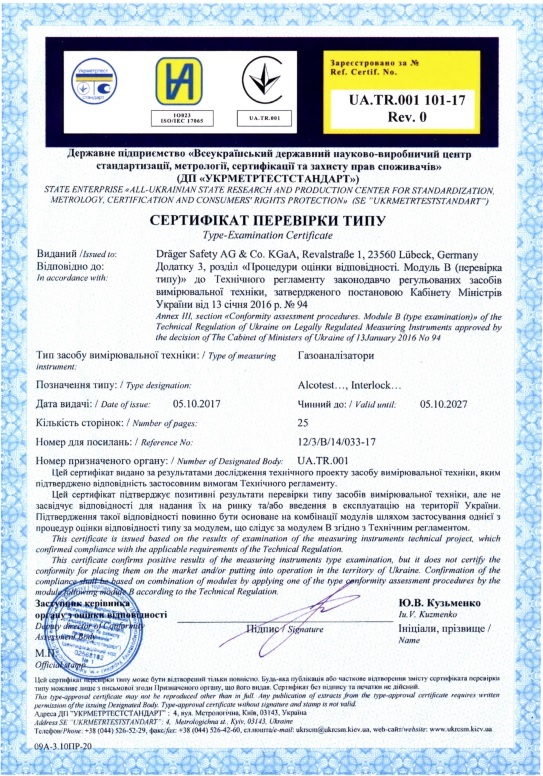 The manufacturer or his authorized representative must provide a copy of the first page of the Type Verification Certificate under Module UA.TR.001 101-17 Rev.0 of 05.10.2017 and a copy of the Declaration of Conformity drawn up in accordance with the requirements of the applicable legislation. The gas analyzer must be sealed in accordance with the Type Verification Certificate according to Module B UA.TR.001 101-17 Rev.0 of 05.10.2017. The software must meet the requirements specified in the Type-Certificate Verification by Module UA.TR.001 101-17 Rev.0 of 05.10.2017. Means of protection: a security element "SDI" (seal-label), which collapses when attempting to remove an element from the object of protection. Markings and inscriptions: The mark of conformity and additional metrological marking in accordance with the Technical Regulations should be placed on the service-guarantee books of gas analyzers, as well as in battery compartments. The Service Guaranty must also have a Type Verification Certificate number.